Design a novel biodiesel (BD) reactor in a continuous flow through enzymatic catalysis in immobilized media. Under 0.5 ml min−1 of continuous flow, the BD yield varied from 26.8% to 28.9% in 11 h.
The pore size of the permeable membrane (38 μm), allowing a higher contact between the fluids and the lipase. Combination of pretreatment and continuous flow reaction have a promising future for BD production. Increasing energy demands coupled with decreasing fossil fuel resources create an urgent need to switch over bio-based fuel, such as biodiesel. 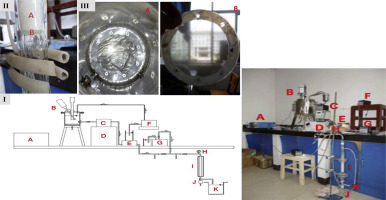 In a newly designed reactor, the production of biodiesel was conducted with soybean oil (SBO) in solvent-free system through transesterification by immobilized Burkholderia cepacia lipase under the influence of ultrasonic emulsification. Effects of operational parameters viz. methanol-to-oil molar ratio, water concentration, immobilized enzyme concentration, and temperature on fatty acid methyl esters (FAME) yield were investigated. Molar ratio and enzyme concentration showed a significant linear correlation with biodiesel yield (r = − 0.8 and 0.6; respectively). Linear regression analysis of both parameters later revealed a significant prediction ability for biodiesel with a yield of 78.8 and 31.7%, respectively. FAME yield was 30% at 7 h in the pretreatment reactor. Without ultrasonic emulsification, the yield was significantly enhanced to 64% for the same reaction time in the packed-bed reactor. However, the reaction time was further reduced significantly under the influence of ultrasonic emulsification coupled with immobilized lipase as a catalyst and resulted into higher biodiesel yield of 68.6% at 3 h. Clearly, ultrasonic emulsification-assisted immobilized lipase catalysis of SBO might be a potential alternative route to conventional methods of biodiesel production.